I’m kind of in between co-workers in our Kalamazoo office so I’m spending a little more time in Grand Rapids. Getting home later is one of the downside but the upside is getting to go back to some of my favorite restaurants and finding the new ones since I’ve left. One of my colleagues in Grand Rapids is one of the social media influencer type of people She always knows the hot new places in town and she knows how much I like fried chicken. I just happened to be in Grand Rapids on the day Hancock opened. 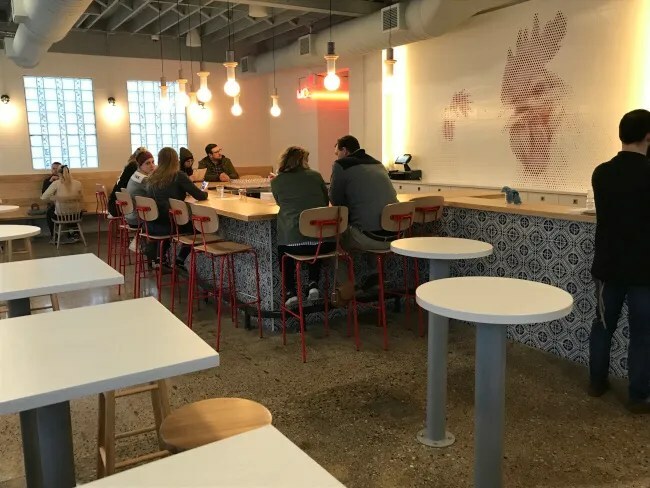 It’s a new Nashville Hot Chicken from the people behind Donkey Taqueria. I didn’t go on opening day but I was back in town a few days later and had some time for dinner. Hancock is on the corner of Wealthy and Fuller in the East Hills Neighborhood. The building is an old service station turned restaurant that was most recently Wealthy Street Station. The building has been cleaned up quite a bit. The biggest change from the outside is the elimination of the parking lot around the building. Where all that concrete used to be is a fenced in green space that will become an outdoor dining space when the weather gets nicer. I found a spot on the street to park about a block away in front of the Little Caesars. 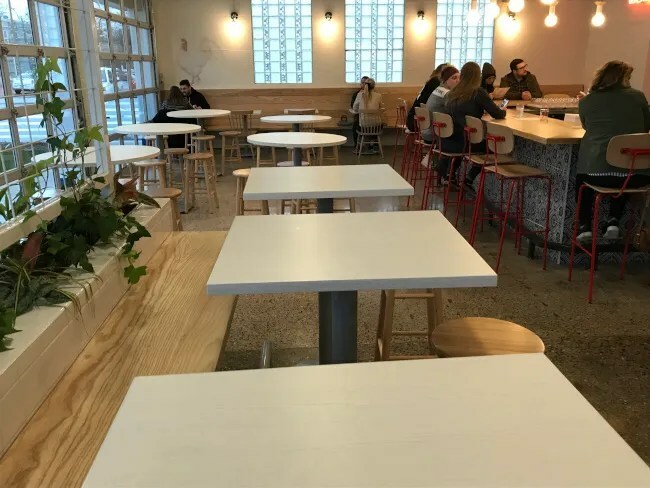 If you ever ate at Wealthy Street Station (and you really should have if you didn’t), you will barely recognize the space now. Hancock did a complete overhaul of the place. 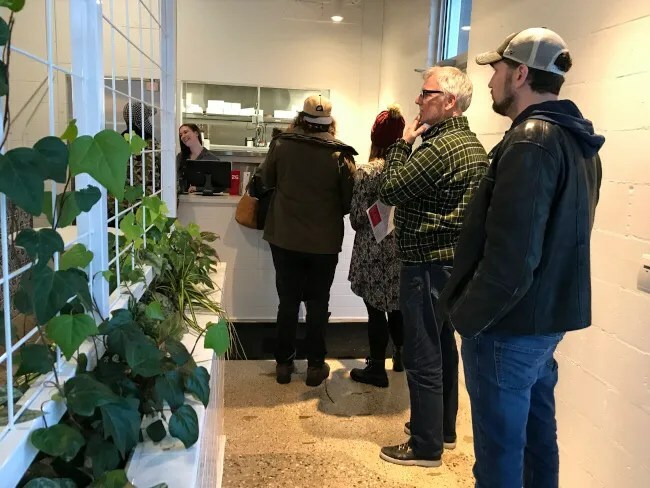 When walking in the door, there’s a trellis that pushes you to a small hallway like walkway leading to the cash registers. 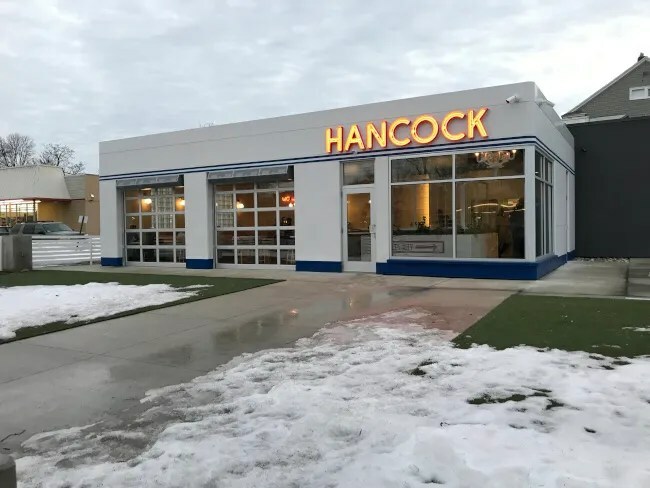 For the most part, Hancock is a counter service restaurant. There are two cash registers on a small counter near the kitchen. There are paper menus along the wall to look at while waiting. Once your done ordering, you are given a number to go find a table and the food is brought to you. The dining room is not huge but they pack the tables in to the small place. Most of the tables are pub table sized and there are various different configurations that make it comfortable for a single diner or a group. The one place there is full service is at the bar. There’s a decent sized bar along the back wall where you can get beer and cocktails with your meal. The menu is pretty much all fried chicken and sides. 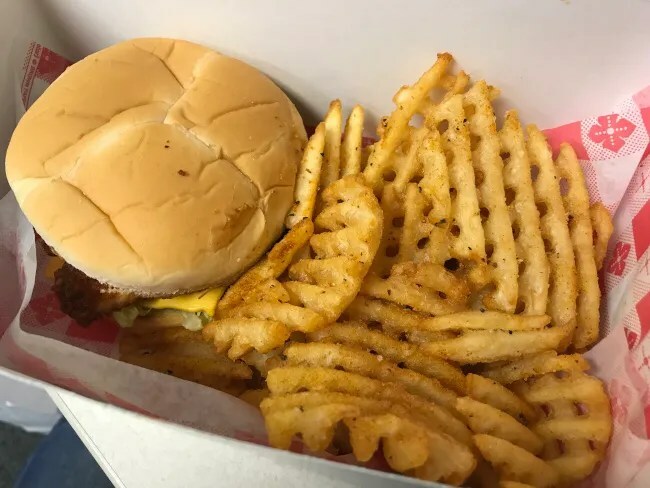 I picked the Hot Chicken Sandwich and an order of Waffle Fries. I put my order in to go and gave the cashier my name. She told me to take a seat and it would be brought out. Once the line died down, she went to do something else and the other cashier just let it sit on the window for several minutes without bringing it out. As I was about to get up and ask, three more people walked in so I got in line behind them then had to ask if that bag on the counter was mine. It was. She handed to me then tried to ring me up again. I didn’t ask for a receipt so we had to bring the other lady back over to find the order on her kiosk to prove that I paid. I started in on the fries in the car. 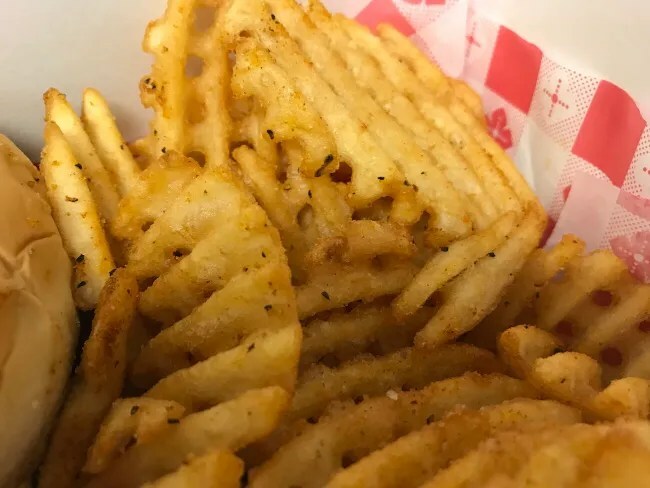 They were pretty solid but simple waffle fries with a heavy salt and pepper seasoning. 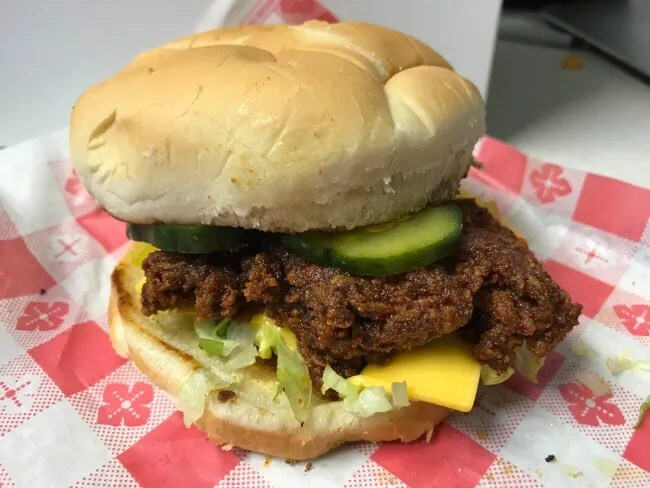 The Hot Chicken Sandwich is a fried chicken breast with choice of hotness factor. I went second from the bottom. It’s served on a toasted potato bun with lettuce, cheese, pickles, and mayo. The chicken is deliciously crispy on the outside and soft and juicy in the middle. I should have went to the next level of hotness. The level I was at had great flavor but not a lot of hot. Next time I’ll move up. The butter pickles were a great addition and another level of crunchy while the cheese and lettuce worked to combat what heat was there. The cost of my meal was just a little under $13 and that didn’t include a drink. 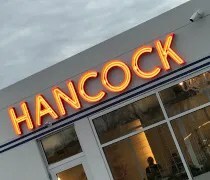 Hancock is fantastic. 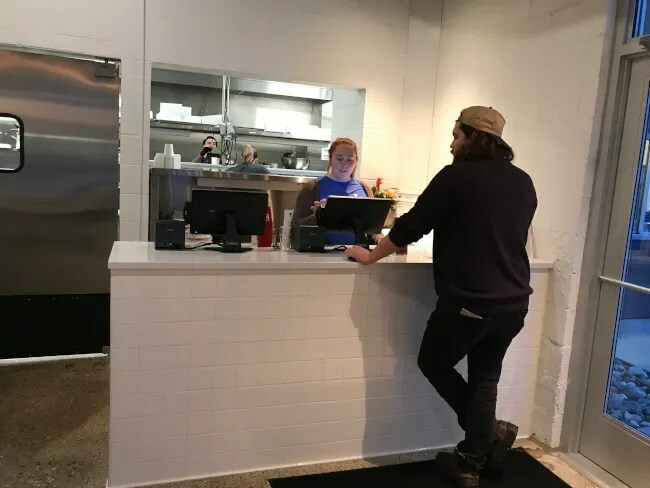 Somehow, I’ve never been to Donkey Taqueria or The Winchester but I’ve always known them to be high quality places from friends that go to these places often. Hancock would fall in line with that. I love that it’s counter service so I can stop in on my lunch break and quickly get a sandwich. 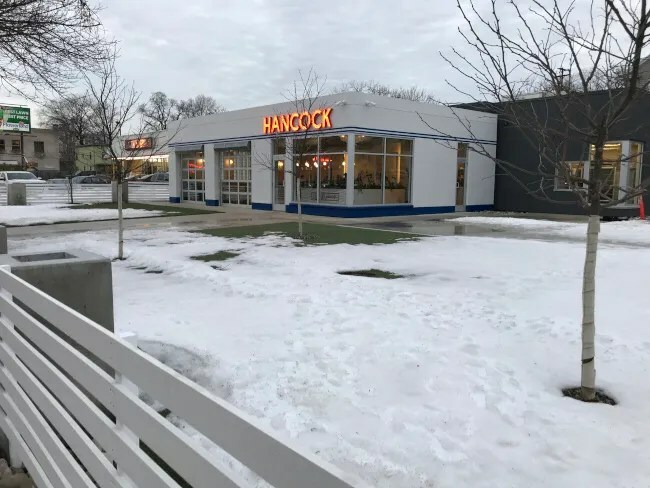 This is going to be another great place in this area once that large patio is open this summer to hang out. There’s not a place I’m aware of that does Nashville Hot Chicken in Grand Rapids so they bring that uniqueness to town as well.